Tawa hallae: Illustration of the newly discovered theropod dinosaurCourtesy Jorge GonzalezA new dinosaur found in New Mexico is changing how scientists view the early beginnings of the ruling reptiles. Tawa hallae was a small, carnivorous theropod measuring about 6-13 feet in length that hunted its prey during the late Triassic period not long after dinosaurs first appeared about 230 million years ago. Theropods are a group of mostly carnivorous dinosaurs that include the popular Tyrannosaurus rex. Until now, the record of Triassic theropods in North America has been somewhat lacking. But Tawa is helping change that. Several high-quality specimens of T. hallae were uncovered, along with the remains of two other early meat-eaters in the spectacularly colorful strata around Ghost Ranch, an area near the town of Abiquiu in northern New Mexico. T, hallae's type specimen – that is the fossil that defines the species – was a nearly complete skeleton of a juvenile. The new study appeared in this month in the journal Science. Digging out Tawa hallae at Ghost Ranch, NM: Sterling Nesbitt (left) and Michelle Stocker at work in the Hayden Quarry.Courtesy Randall Irmis, University of UtahThe bones Tawa hallae display similar features found in later dinosaurs (including birds) such as hip structure, hollow bones, and space for air sacs in some vertebrae. But it also contains characteristics found in other early carnivores, such as Herrerasaurus, another Triassic period biped. Herrerasaurus remains have been found in Triassic rocks in South America, alongside the earliest known remains of the two other dinosaur forms: sauropodomorphs (long-necked herbivores such as Diplodocus), and ornithiscians (beaked herbivores such as Stegosaurus). Considered by some paleontologists as one of the earliest dinosaurs. Herrerasaurus displays some theropod features but is missing traits found in others, leading some scientists to speculate whether it was a theropod at all, or even a dinosaur. But according to Sterling Nesbitt, a paleontologist and the study's lead author from the University of Texas in Austin, Tawa hallae has answered some of those questions. "Tawa pulls Herrerasaurus into the theropod lineage, so that means all three lineages are present in South America pretty much as soon as dinosaurs evolved," said Nesbitt. "Without Tawa, you can guess at that, but Tawa helps shore up that argument." 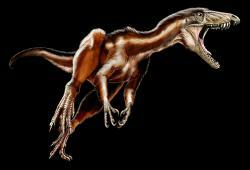 The remains of two other distinct theropods were also found in the same quarry at Ghost Ranch. One displayed characteristics that made it closely related to Coelophysis (found elsewhere at Ghost Ranch), and the other to Herrerasaurus - indicating the lines diverged before the unified landmass Pangaea split apart into separate continents. “When we analyzed the evolutionary relationships of these dinosaurs, we discovered that they were only distantly related, and that each species had close relatives in South America,” said Randall Irmis of the University of Utah. “This implies that each carnivorous dinosaur species descended from a separate lineage before arriving in [the part of Pangea that is now] North America, instead of all evolving from a local ancestor.” Irmis co-authored the study, and also works at the Utah Museum of Natural History. Oddly, no sauropodomorph or ornithischian remains from the Triassic Period have ever been found in North America. Scientists admit that's somewhat perplexing but think it's possible they migrated through the area when it was still part of Pangaea. But thanks to Tawa hallae the evolution of the theropod line is becoming clearer. "Tawa gives us an unprecedented window into early dinosaur evolution, solidifying the relationships of early dinosaurs, revealing how they spread across the globe, and providing new insights into the evolution of their characteristics," Nesbitt said. Ghost Ranch, New Mexico: The spectacular rock formations at Ghost Ranch display strata from all three geological periods of the Mesozoic era and have proven rich in Triassic-aged fossils.Courtesy Mark RyanThe remains of Tawa hallae were found at Ghost Ranch in northern New Mexico about 65 miles north of Santa Fe, the same area where the spectacular Coelophysis remains were discovered in the late 1940s. Both species were found in the Chinle formation (pronounced chin lee), although Tawa’s fossils were found lower in the strata, in the older Petrified Forest member of the formation. The rich bone bed was first discovered in 2004 by amateurs on a week-long paleontology seminar sponsored by the Ruth Hall Museum at Ghost Ranch. Tawa hallae was named for the Hopi word for sun god, and in honor of Ruth Hall, the museum’s founder.